Itty Bitty Witty Knitties is a cottage industry based in Idaho. The knitted swatches and mini-quilts are handmade by a group of about a dozen disabled women who participate in the vocational training programs of Asia Project Grace in Kunming, China. Involvement in these projects has given these women access to education, health care and a living wage. 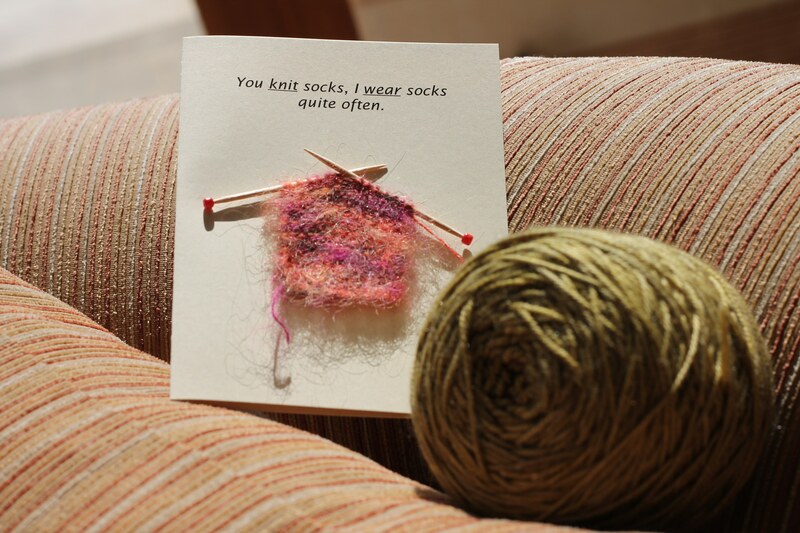 Each card has a hand-knitted swatch on the front and the sentiment on the front, completed inside. You can ignore 80% of what your inner sheep says. … Most of it is b-a-a-a-a-d advice. 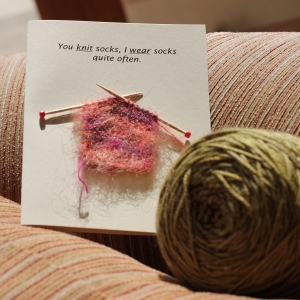 Would you be the designated knitter this month? … You know – the one who stays sober enough to fix everyone else’s mistakes. And now for the final word on knitting socks: … Whaddya MEAN, you’d kinda like one for the other foot?! You knit socks, I wear socks quite often. … We’re practically twins! Peace on earth … good wool to all! Knitting is just one of my guilty pleasures. … Don’t ask. On a scale of 9 to 10, 10 being “gone completely ‘round the bend,” … how far would you rate your fiber addiction? Brevity is the soul of wit. – Shakespeare … Hap Birt! Surely you can take a little ribbing on your birthday? Welcome to the fold, little lamb. In honor of your birthday, an angora rabbit has been donated in your name to a women’s knitting co-op in a remote village a half day’s walk from Ayacucho in the Peruvian Andes. 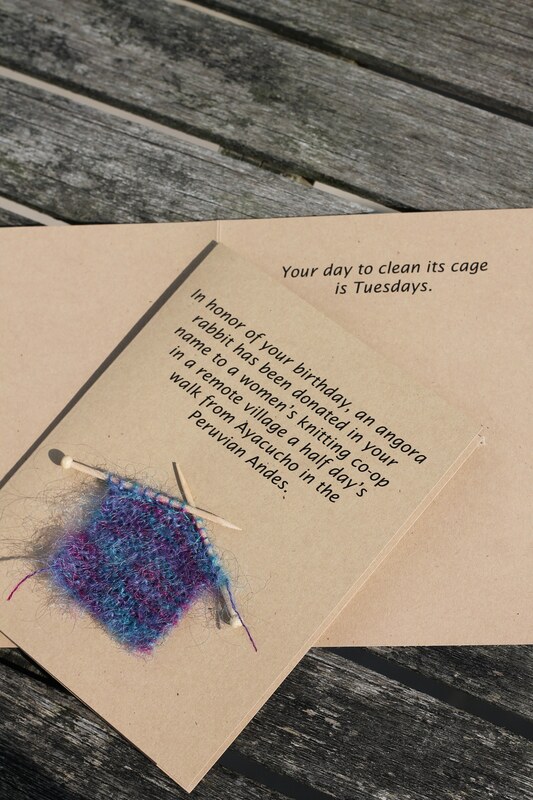 … Your day to clean its cage is Tuesdays. I’m feeling a bit sheepish about missing your birthday. … If this were cashmere, I’d be feeling a bit goat-ish. Better late than woolly, woolly late! … Happy Birthday, an itty bitty bit late. Thank ewe. … I woolly appreciate your kindness. Fleece Navidad! … from the ba-a-a-ah-tom of my heart.